Picton is the gateway to the scenic Marlborough Sounds for many, whether your cruise ship is in port or you’ve just arrived off the Interislander from Wellington. 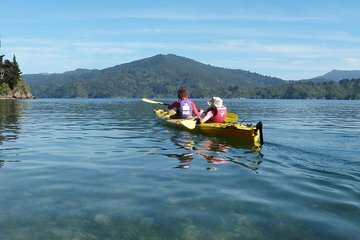 This half-day kayak tour is a great way for even the most time-pressed traveler to experience the bays, beaches and bush-lined coasts of the region. Head out in the morning or afternoon in your sea kayak with a guide to show you around so you don’t get lost. We are happy to collect you from your accommodation in Picton with prior arrangement.